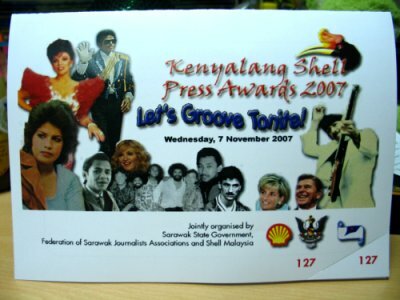 Every year, journalists and reporters in Sarawak will come together for the Kenyalang Shell Press Awards, an award recognising excellence in journalism. It is like the Academy Awards here, and the biggest perk about winning something is the prize money. Because we glamorous journalists are so well paid in this business, most of us can only afford to drive Kancils. If you win something, you will definitely be able to make the down payment for another Kancil and have something leftover to chia colleagues who know you have the money. I’m not blogging because I won something or I went and want to tell you how exciting it all was. I’m blogging because I’m baffled that I was invited. Based on what longer serving colleagues told me, you only get invited if you submitted something (and therefore stand a chance of the night being worth leaving the house for). I didn’t. As long as I’ve worked for the paper, I’ve not written anything that fits into the category of any local awards. Heck, I don’t write anything that fits into most “writing contests” organised on this side of the country ever. Not unless they start giving out awards for best Book/Movie Review. I guess their MO is different this year, but I don’t plan on attending. I have what promises to be a long work day in store for me and the last thing I want to do when I get back is dress up, overeat and watch other people get awards. I’m sure they deserve it and I’m happy for anyone who gets a windfall, but I don’t have a reason to be there. I got other things to do. Now if they took my advice on the dress code/theme, it would have been a different thing. I remember colleagues discussing the dress code – 60’s, 70’s or 80’s? I suggested that we dress up as something fun and out-of-the-box – accident victims. It would have been fun. We can wear whatever we like as long as we are in casts, bloody bandages, wheelchairs, crutches and bleeding from gashes. Fashion of the decades is done done done. If accident victims is too crass, I have other suggestions, like ninjas and pirates. I’d totally go just so I can dress up as a pirate wench in public. 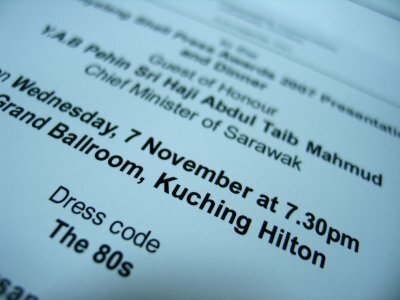 But seeing who our guest of honour is, anything fun and out-of-the-box is out of the question. On a related note, the company that throws the coolest annual staff parties is KFC. Everyone came in costume, even the top brass.